1. Understand the difference between atoms and molecules and recognize how how different atoms can come together to make various molecules. 2. Learn several new molecule names and their chemical formulas. 3. Recognize that the subscript describes how many atoms are in a molecule and that if there is no subscript that means that there is one of that type of atom in a molecule. 4. Recognize that the coefficient is a number which describes how many of a particular molecule is present. Click on the image below to download and run the virtual molecule lab. It takes a few minutes to download and run, so be patient. 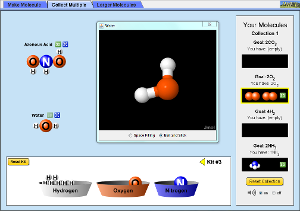 If clicking on the image does not work you can go to http://phet.colorado.edu/en/simulation/build-a-molecule and click on "run now." Have fun making lots of different types of molecules and collecting them all.